This may seem like an odd place to start on our list of encouraging Bible verses for men. However, this one speaks to God’s original intent for us. God didn’t place Adam in the Garden of Eden to relax and have a party. There was work to be done. Adam was to find fulfillment and pleasure in following through with God’s plan for him. God places us all in our specific positions (jobs) for a reason. We can find purpose where we are planted even if we may be struggling with certain aspects of our job. Even through tough job circumstances we can honor God with our effort and fulfill his purpose for us to work. God spoke this to Joshua before he led the nation of Israel into the Promised Land. Can you imagine that? Leading an entire nation into a foreign country to do battle with your enemies? And to top it off, his mentor Moses had died. Now Joshua is on his own. No wonder he felt fear. God’s words to Joshua serve as encouragement in times of fear. God promises to be with us wherever we go, no matter what insurmountable odds we may face. These encouraging Bible verses for men hold such promise. For the man who rejects godlessness and follows the ways of the Lord, tremendous blessings follow. The imagery here that describes the man who puts his delight in the Lord is powerful. Just like a giant tree, this type of man will be fruitful, steadfast, alive and thriving. He will not wither when the heat of trying times comes. It seems there are a lot of encouraging Bible verses for men that deal with the subject of fear. Here is another one. We may feel vulnerable at certain times of our lives. Those moments can come from our own self-imposed failings and conflicts or from external forces around us. In those times it’s comforting to know that we have an advocate, someone who will stand beside us even though all others may desert us. In the end the Psalmist says – for those who have a relationship with the Lord – what can other men really do to us? Even if they would threaten us harm, we know our ultimate destination is in heaven, a place infinitely better than our current life on earth. The Christians of the early church recognized this and were willing to give their lives at the hands of their Roman oppressors. Are you mixed up in some kind of sin? Does it feel like you can’t escape the pattern of poor behaviors that are dominating your life? This Bible verse makes it clear there is hope to turn around whatever has you trapped. The formula for cleansing your way and turning from sin all has to do with God’s Word. This verse tells us to “take heed” to it. That means not only will you have to read it but you will have to follow the instructions found in it. If you make that a consistent habit in your life, then sin and ungodly behaviors will slowly fade away. God’s Word has the power to turn around any life. As a general rule, woman are a lot more talkative than men. Men tend to keep things inside whereas women generally feel more freedom to share with one another. This verse tells us though the power of being there for a friend. Not only is their bonding that occurs but being there for a brother in Christ can uplift them, keep them accountable and makes them feel better. Men need each other in the worst way. We tend to keep things bottled up because we don’t think anyone wants to hear or wants to help. That only leads to problems. We need to come along side our friends who need someone to share with and be an encouragement to them. If you know someone you could reach out to, do so today. Of all the encouraging Bible verses for men, this one may be the most valuable. Men love to make plans. Everyday we dream about our plans for the future – plans for our family, for our career, for our finances and for the giant deck off the back of the house. It’s in our DNA to want to know what’s coming in the future and have a plan to guide us. Unfortunately, our planning can get out of hand sometimes. We can become obsessed with it. When that happens we often neglect the moment, miss out on opportunities in the present and disrupt the lives of those around us. God has a plan for each of us. While it may be hard sometimes, we need to rest in His future for us which He promises in this verse. The other great thing about this verse is that God’s thoughts for us don’t include evil. Rather, they are thoughts of peace. The Apostle Paul must have had so many of us in mind when he wrote this encouraging Bible verse. Temptations bombard us every day – temptations to have our own way, to gain power, to take the short cut by lying, stealing or cheating, to lust, to do anything that makes our bodies feel good…the temptations are truly endless. It seems like the temptations never end. But God is faithful the verse says. He won’t let you experience more temptation than you can handle. The best part is, with each temptation, He will provide a way out for you, if you will take it. And perhaps most importantly, He will give you the strength to endure through the temptation. That’s reassuring to know because we can’t beat temptation in our own power. I love short Bible verses that pack a powerful message. There are four big bullet points in this one that every man can relate to. The verse says to “watch” – in other words, be a guardian. 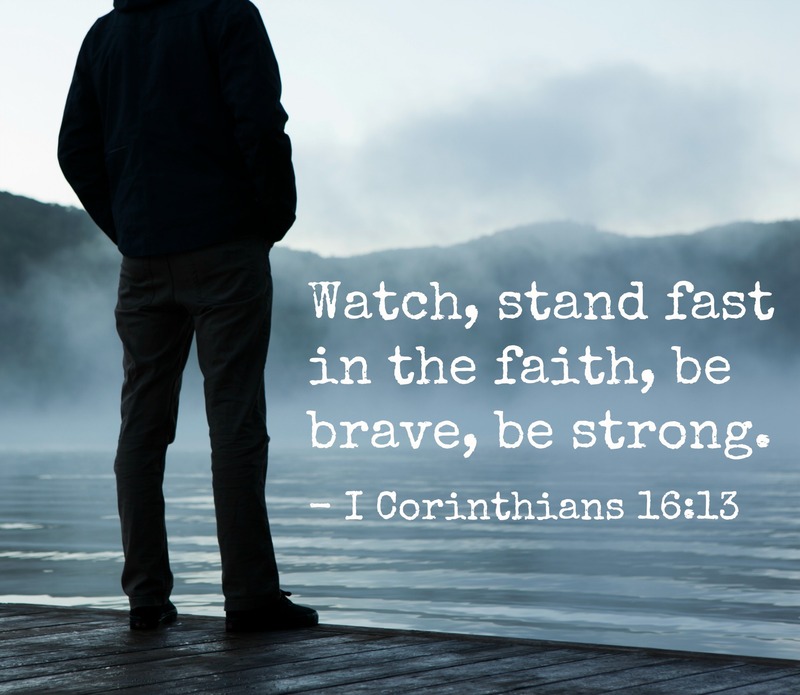 It says to “stand fast” – in other words, hold your ground and defend your faith. And finally, we are told to “be brave” – in the face of persecution, ridicule or mockery of our faith. And we are told to “be strong” – to be a rock of determination and leadership to those around us. This verse makes the encouraging Bible verses for men list because there may be nothing more emotionally demoralizing for a man than to see his body deteriorate. The physical prowess you once had in your teens and 20s will fade away as you continue to age. You may be able to stay reasonable fit but your body will become weak and perish one day. God didn’t design our physical bodies to last forever. I don’t know any man that enjoys trials. We’d just assume life proceed at a smooth pace without any obstacles rearing their ugly head. Unfortunately, (or fortunately depending on how you look at it) that’s not the case. Trials will come. And sometimes they come in waves and really test your faith. God has a purpose for the trials you face. This verse clearly states the reason. It’s to produce patience in your life – patience in others, patience in yourself and patience in God. So the next time you are faced with a hefty trial, thank God for it. He’s doing a work in your life that can’t be accomplished unless you face some adversity. These verses brings several hot-button issues for men to the forefront. We don’t listen the way we should. We don’t think about the things we say and how they impact others around us. And we let our emotions boil over into anger – anger that in many cases causes us to do things we regret. Could many of our problems be solved if we’d truly listen to what’s being said instead of thinking of what to say next while the other person is talking? Would we reduce conflict by holding our tongue and not letting every idle word slip out? Might we live a more peaceful life if we didn’t get angry all the time? The answer is “Yes” to all three questions. The final of our encouraging Bible verses for men touches on the topic of prayer. It challenges us to confess our sins to one another and pray for each other so there can be healing within the body of Christ. It does no good to withhold forgiveness and begrudge those who have done you wrong. This will only allow bitterness to take hold of your life. You won’t be able to move forward and live an effective, joyful life if you harbor bitterness towards others. In the end we are told that the prayer of a righteous man “avails much.” In short, that means they help. Prayer is beneficial. So do it daily and seek God for everything. You may have to wait for some answers but He won’t disappoint. Questions for Discussion: What other encouraging Bible verses for men do you have to share? How have you seen the Bible impact your life? No problem Andrew. Glad they were a blessing…thanks for reading! This is amazing! I have just prayed through each of the points for a specific man in my life and it has helped so much! Keep writing and encouraging God’s kingdom. That’s awesome Harriet! So glad this was a helpful resource for you. I am definitely sharing these with my husband! You bet Stephie. Thanks for reading (and sharing)! Brian, can these be copied and printed for distribution at our men’s retreat? Absolutely…I’d be honored! I’d appreciate you just site in your literature where they came from. Thanks for reading and God bless your retreat. Amen. I always keep coming back to your blog Brian for these wonderful uplifting Bible versus. Thanks. Great article Brian, I couldn’t wait to share this with my husband and all of the men I know. Keep up the good work. Thanks for reading and sharing Dani! Praying that it brings hope and encouragement to those with whom you share.